Another recipe that I had created during the recent Fathers’ Day celebration this year was the JAPANESE TOFU WITH SHIMEJI MUSHROOMS & WOLFBERRIES IN AMERICAN GINSENG SAUCE (西洋參枸杞姬菇日本豆腐). It’s such an easy and healthy recipe to storm out within minutes for your family or guests. For vegetarian version, you could always use mushroom sauce and omit the garlic plus the deep fried sole fish powder. 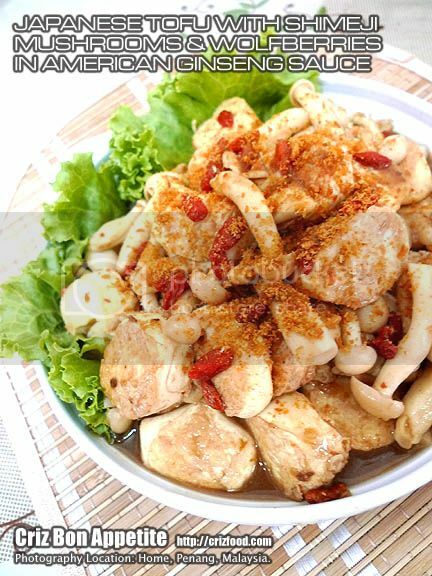 I came out with the idea of creating this healthy dish as it has a lot of medicinal values. Firstly, American Ginseng is can help to slow the absorption of sugar in food and also help the body to cope with stress. Mushrooms on the other hand can have tremendous boosts to your immune system as well as promote dietary management. Wolfberry is believed to be the national treasure of many Asian countries as its medicinal values is so broad, which include anti-disease, anti-aging, anti-fatigue, promote blood circulation, reduce stress and anxiety, promote better vision and more. 1. Heat up some oil and deep fry the Japanese tofu until golden brown. Scoop up and leave aside. 2. Leave about 2 tablespoon of the remaining oil in the wok on low fire and sauté 1/2 tablespoon garlic until golden brown. 3. Add in the shimeji mushroom and sauté for 1-2 minutes. Scoop & leave aside. 4. Heat up 2 tablespoon of oil and sauté 1/2 tablespoon garlic until golden brown. 5. Add in the oyster sauce and sesame oil and about 1/3 cup of hot water. Let it boil. Add salt & pepper to taste. 6. Stir in the shimeji mushrooms, wolfberries and American ginseng powder. 7. Add in the deep fried Japanese tofu. 8. Dish out to serve. 9. Garnish with some deep fried sole fish powder. 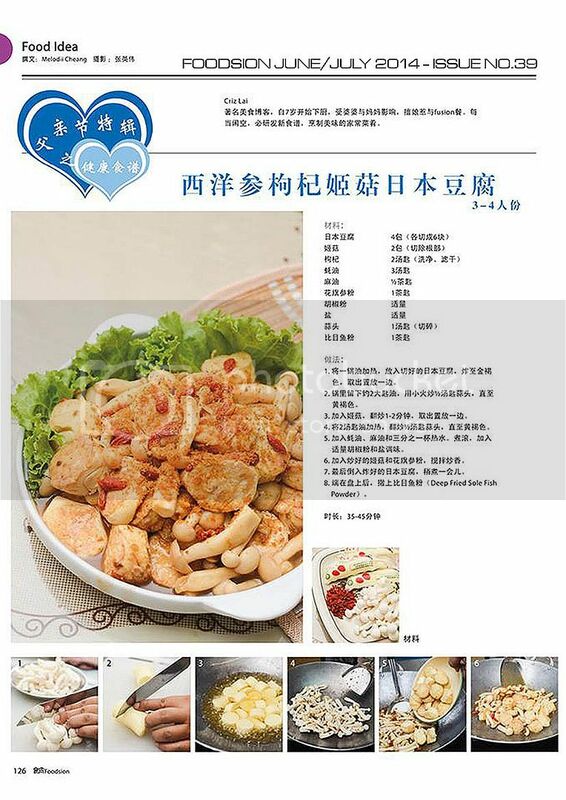 Here’s the Chinese version as appeared in the Foodsion Magazine June/July 2014 Issue No. 39~ You can click to enlarge it for a clearer view.